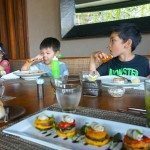 Looking for the best kid friendly restaurants in Bali? 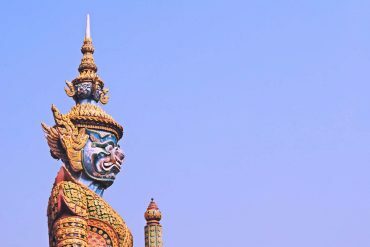 We combed Bali to find the top best places to eat in Bali with kids that have a unique and relaxed atmosphere, family friendly spaces, play areas, kid friendly menus and welcoming service. 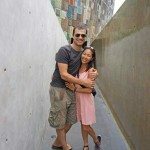 It’s not all kids themes and play gyms there are perfect places to eat in Bali with kids or without where you can enjoy cool vibes. 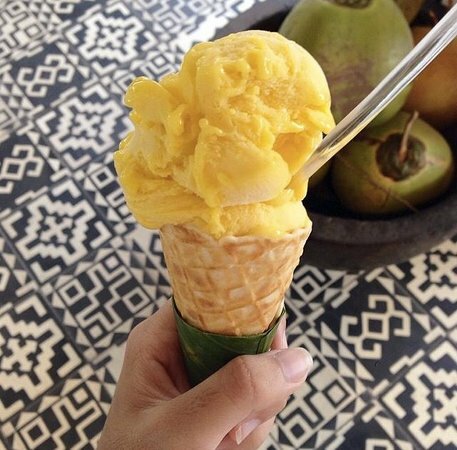 Here are 36 of the very best family friendly restaurants in Bali with kids. 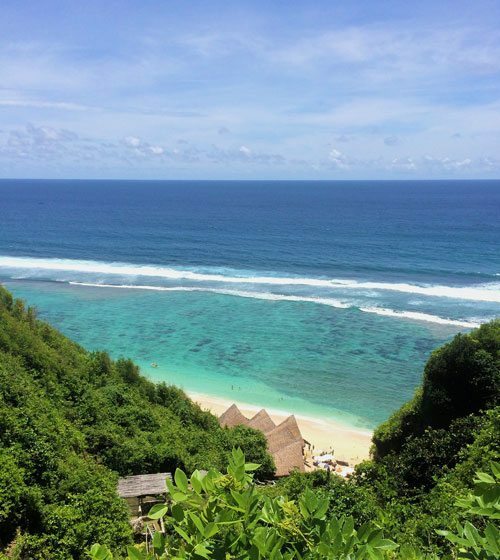 An all time Bali favourite is Ku De Ta, famous for its relaxed beachside vibes and glorious amber sunsets. There’s really nothing better than pulling up a beanbag overlooking the beach with a wood fired pizza and a jug of sangria. Ku De Ta’s menu includes a wide selection of French, Italian, Greek, Moroccan, Thai, Japanese and American fare for breakfast, lunch and dinner. It may not scream kid friendly, but kids are welcome with open arms and it’s one of the very best kid friendly restaurants in Bali. On Sundays, Ku De Ta hosts “Family Dayze” from 11:00 AM to 3:00 PM. Kids can enjoy a great craft tent, exciting bouncing castle, and a chilled out atmosphere. Another among the best kid friendly Bali is open for lunch and dinner. Enjoy Potato Head’s gorgeous surroundings and exquisite architecture. It’s iconic curved facade made from multi-coloured vintage shutters is inspired by a Roman coliseum. There is a vast open green lawn, multiple bars, sun lounges and bean bags and an infinity pool overlooking the beach. An ideal place to spend the day with excellent food options, chilled vibes and tons of space for kids to enjoy. Choose between three menus, depending on where you dine: seasonal and sustainable at Potato Head restaurant; authentic Indonesian at Lilin; and a wide variety of cocktails and snacks at either of the two bars. 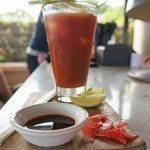 Try the Asian inspired Bloody Mary. 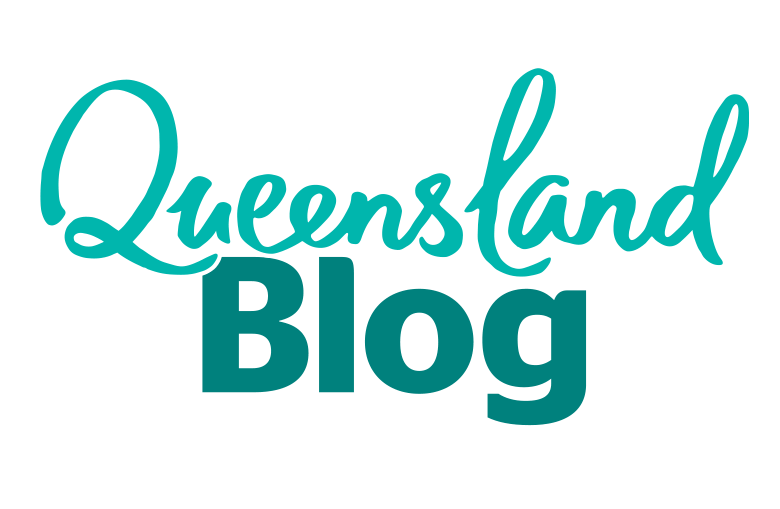 Potato Head is not to be missed with or without kids. 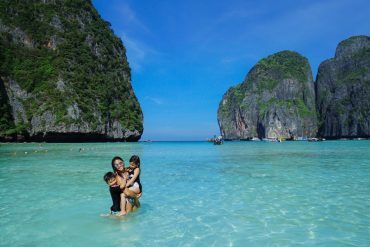 Located at the bottom of Semara Resort’s cliff edge, even the youngest can make it down via a travelator to the private beach, there are a few steep steps towards the end that may require kids in arms. Dine on Barrumundi tacos and Mahi Mahi burgers in a breezy Bali hut overlooking a spectacular vista of turquoise waters and white sandy beach at Finn’s Beach Club Restaurant. The menu provides delicious food with a mix of local, international and fusion cuisine. The kids’ menu options include spaghetti bolognese and margarita pizza. For dessert choose from fruit platters or marshmallows with chocolate sauce. 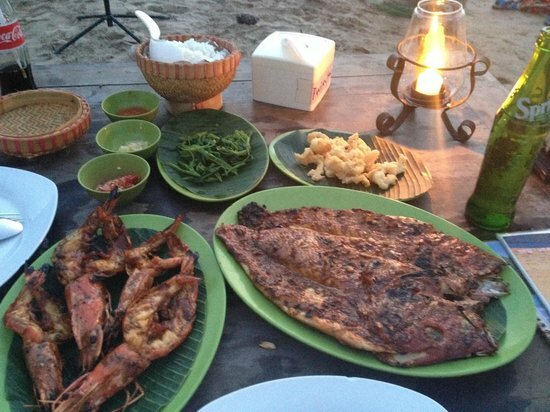 It’s diving setting, secluded beach and greata food make it one of the best kid friendly restaurants in Bali. After lunch, spend the rest of the day paddling in the small lagoons at low tide or under a shady umbrella. 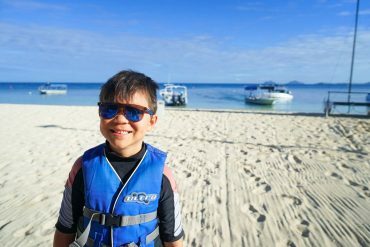 A Finn’s Beach Club day pass provides all day access to the private beach as well as a sun bed with umbrella and water sport equipment including sea kayaks, stand up paddle boards and snorkel gear. Nestled in a cove and sheltered by a small reef, the beach is mostly calm and secluded. However, during the wet season tides can be strong and the cliff top infinity pool is a better place for a swim. Though it’s not the easiest spot to get to, it’s worth the family travel time to get to a very special place to eat in Bali. Call ahead to check if the weather conditions and bookings. Day pass charges are waived once diners play the final bill. Price range: $70-$100 USD for a family of 4 Day Pass: Adult IDR 250.000, Child IDR 50.000 (aged 3-11). 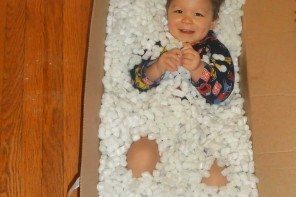 Kids under 3 are free. 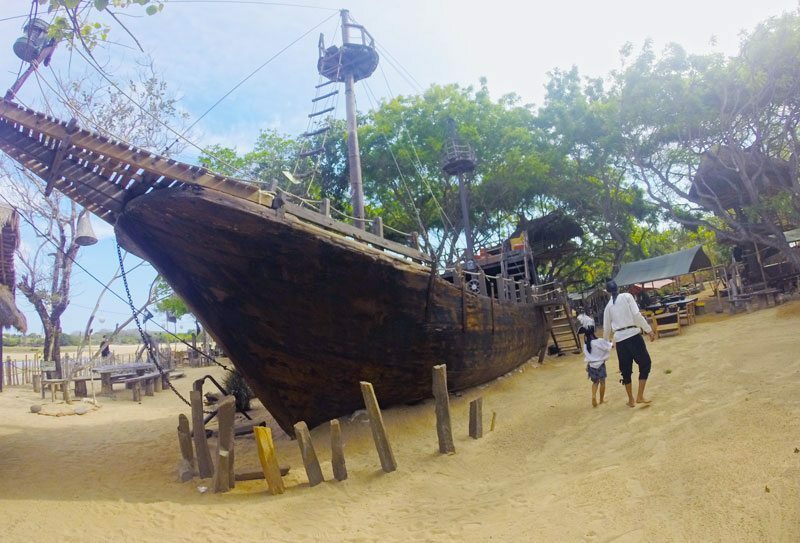 Parents may think this pirate themed restaurant a tad cheesy, however the kids unanimously voted it as on of the beset kid friendly restaurants in Bali. It’s easy to see the appeal with lost islands to explore, buried treasure to uncover and their own huge pirate ship to commandeer. 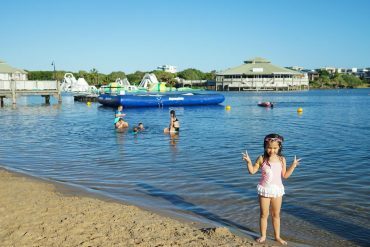 Pirates Bay offers 4000 square meters of sandy play space, there is a zip line, a ropes to course, pirate tents and hammocks. When junior pirates get hungry they can climb up a treehouse and dine overlooking their own private beach. Young buccaneers do not need to set foot on dry land as waiters scurry up the tree for any orders of food or drink. Pirates Bay Restaurant offers a kid’s menu, a combination of Eastern and Western cuisine with vegetarian options. Whilst the food is decent, most families are here for the novelty rather than the stand out cuisine. On terra firma, kids can participate in a fully supervised “Booty Hunt,” with pirate themed activities to keep swashbucklers entertained. For $35 US per child, parents have two hours of kid free bliss to recline on a sun lounge with a cool beverage or get a massage. In the evening, the tree houses are romantically lit with lanterns and there is live entertainment usually in the form of an acoustic duo or occasionally there are Bali fire dancers. 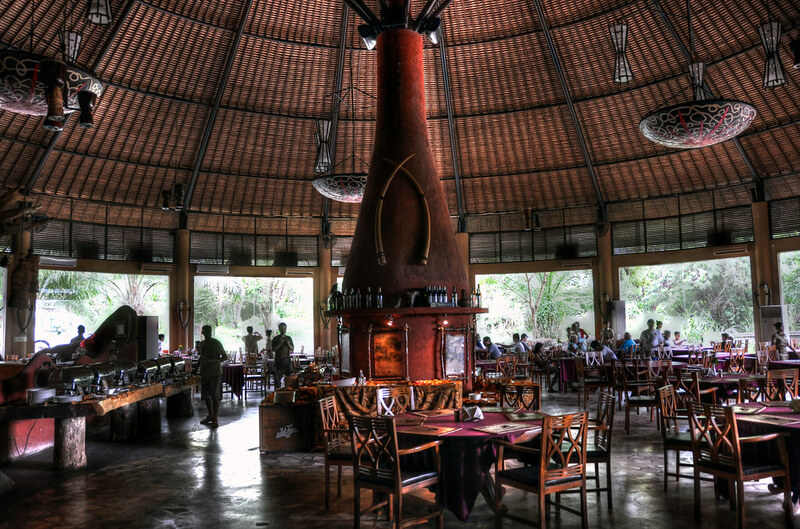 Tree house and shaded dining areas at Pirates Bay Bali. 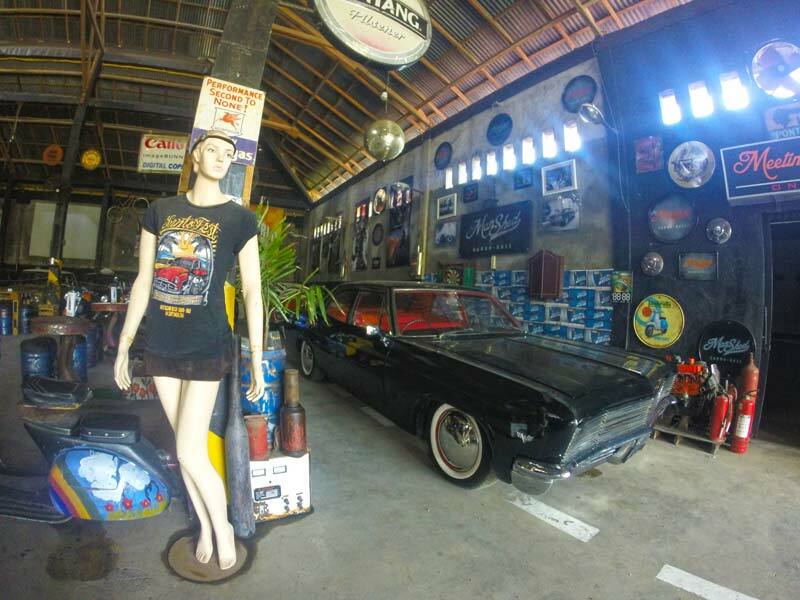 Set amongst rice paddies, Deus ex Machina in Canggu manufactures motorbikes, bicycles, surfboards and skateboards. It’s a very cool establishment and it’s laid back vibe makes it one of the best kid friendly restaurants in Bali. The eclectic property, dubbed the Temple of Enthusiasm, mixes an on-site photo studio, art gallery, and live entertainment with good food and drink. Families can enjoy a varied Pan-Asian menu with breakfast burritos, fish tacos, sushi, thai curries and noodles on the menu. Kids have their own menu to choose from mini sliders with chips, pasta and noodles. Parents must try the coffee and signature Dirty Bingtang Beer. Kids have ample space to run around and bean bags to chill out to whilst listening to live music. Around the back kids can watch pro’s put together a custom made motorbike or surfboard. Open for breakfast, lunch and dinner, Deus ex Machina offers something uniquely Bali and worth a visit whilst in the Canggu area. Warung Mina in Seminyak serves local Indonesian dishes in a traditional Balinese restaurant. Families can dine in a gazebo overlooking fishponds and gardens or alfresco with courtyard tables where kids can have a run. A favourite with families and one of the best kid friendly restaurants in Bali. Children’s selection include: nasi goreng, mie goreng or a small selection of Western menu items including pizza and chips. 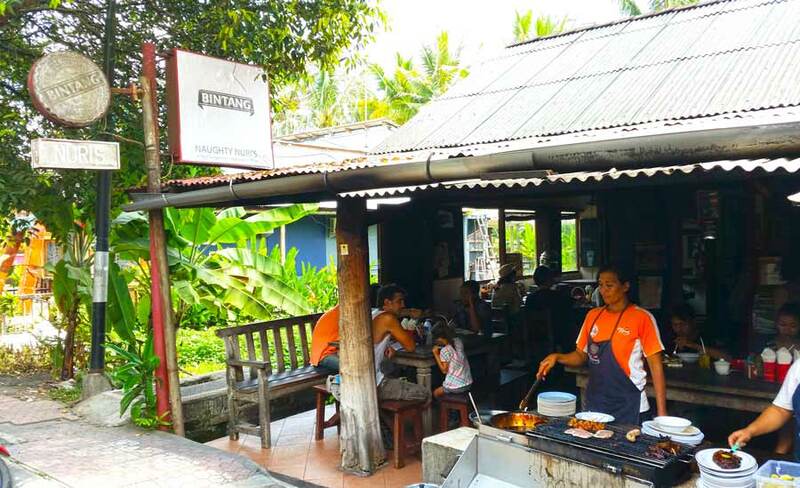 Warung Mina offers affordable, good, clean and authentic dining in the heart of Seminyak. 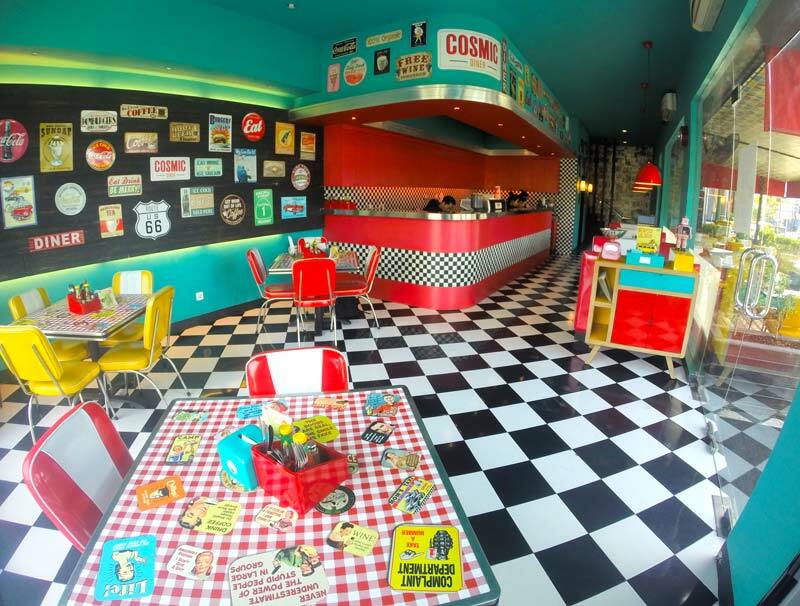 Located in Lipo Mall in Kuta, kids will love Cosmic Diner’s extremely family friendly menu of burgers, pancakes, fries and milkshakes. Parents may or may not love the quirky retro 50’s themed décor, but they will love the American diner style booths to keep little kids contained. Kid will just go nuts for it and reason why it’s one of the best kid friendly restaurants in Bali. 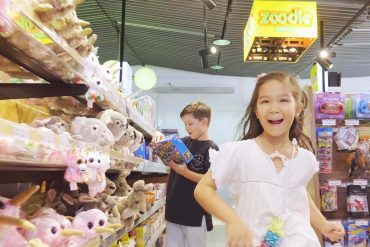 This Indonesian themed franchise is an affordable and convenient family dining option with enough bright splashes of primary colours, catchy tunes and kitsch on the walls to keep young members occupied. Try the chicken parmigiana and caramel milkshake. Murni opened the doors of her traditional Indonesian restaurant in 1974 and can still be found operating the very first restaurant in Ubud. It now incorporates a noteworthy shop filled with traditional textiles, arts and crafts, a spa and guest residences. 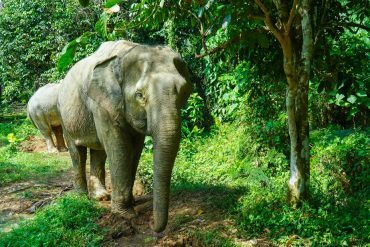 The restaurant spills over the lush green hillside overlooking the river with four open-air levels, serving traditional Balinese dishes with extensive vegetarian options as well as a Western menu. Filled to the brink with authentic Balinese culture and good local food, it’s a must visit and one of the best kid friendly restaurants in Bali. Entrance to Murni’s Warung, Bali. Balcony dining overlooking the river. An absolute must with kids and without a doubt one of the best kid friendly restaurants in Bali is Lello Lello. This gelato place is perfectly on trend with funky décor and clever gelato inspired mantras scribbled across its walls. Parents can choose from funky flavours like Strawberries and Champers, Avocado and Chocolate, Orange and Goat Cheese and Jack Daniels with Oriels. There are the less adventurous flavours that are equally delicious including bubble gum, mint choc chip and the fluro pink dragonfruit sorbetto. Also on the menu are pancakes, waffles and light breakfast foods, as well as curries from Petite India next door. The Italian style Prego Restaurant is part of the Westin Resort Nusa Dua. You cannot get any more family friendly every Sunday than FunDay Family Brunch. Kids can enjoy supervised games and activities including a SuperChef program where kids don mini chef’s hat and apron to create their own menu. With a focus on good food and entertainment, instead of a buffet, Prego presents a semi ala carte menu where selected dishes are prepared to order at an open-plan kitchen. From antipasti and salads to roasted meats, pasta, pizza and regional specialties to sweet treats like cakes, crepes, homemade gelato and even cotton candy. It’s easy to see why Prego is one of the best kid friendly restaurants in Bali. There’s a kids corner with video games, sand and water play, as well as photo opportunities with Pippo the Squirrell. Afterwards, kids are welcomed for a swim in the resort pool. Kids 13 years and under dine free. Pipo the Squirrel also pops in for photo opportunities while the resident magician roams around performing tricks. Price range: FunDay Family Brunch at Prego is priced at just IDR 360,000 ($37 AUD) er person including welcome glass of prosecco, soft drinks and signature iced teas. Kids eat for free (2 kids under 12 years) when accompanied with parents. In addition, SPG members are entitled to a 20% discount. Open Hours: Moday to Saturday, 11:30 AM – 11:00 PM; Sunday 11:30 AM – 3:00 PM. A popular nighttime haunt, the uber trendy Motel Mexicola offers plenty of technicoloured space for kids to play during the day. Kids can run around the alfresco 50’s themed Mexico Acapulco courtyard or head inside to dine in booths with bold paintings and catholic relics adorning the walls. 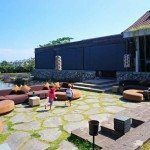 It’s not a place that would scream family friendly, but all the better to go, whilst families are stuck in themed restaurants your kids will be chilling out around quirky surrounds and open spaces with quick and tasty food, whilst the parents sink Corona, which makes it indeed one of the best kid friendly restaurants in Bali. Families will love the fun and upbeat atmosphere whilst dining on quesadillas, fresh tacos and churros. Motel Mexicola is a great place for a drink at night, better still if you have a nanny or arrange a babysitting service. The Aussie owners have created a relaxed, kitschy vibe with guest DJ’s and free flowing tequila shooters. Famous for their pool view and wood-fired pizzas, the Hard Rock Hotel’s Splash Bistro is a great place to spend the day relaxing by the pool. Right on the main drag of Kuta, slip into Splash Bistro’s beach club vibes when the touts and crowds gets too much, Families will can also try some aqua aerobics and volleyball or relax by the pool with cocktails. All day food options include pizza, pasta, and seafood. Mostly Indonesian with a few Western options, Warung D’Saweh is known for its calm atmosphere and idyllic views. 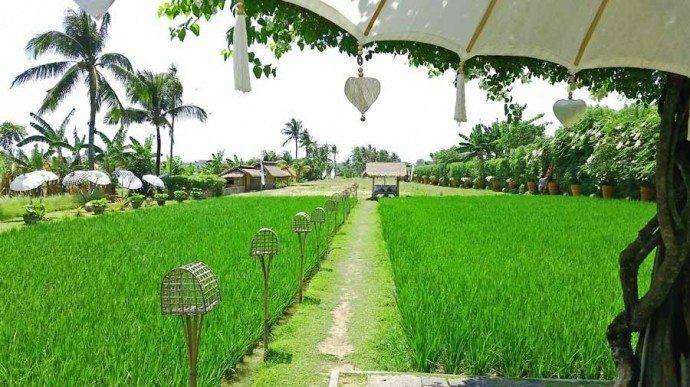 Set among the rice paddies of Bahasa, enjoy your meal as you relax and take in your surroundings. If you can, aim to be there for sunset you’ll understand why it’s one of the best kid friendly restaurants in Bali. Specialties include the crispy duck, mie goreng, and nasi campur. You must try the spring rolls as well. Vegetarian options available. Although not part of the restaurant, be sure to stop by and see the nearby tribal huts on stilts, for a postcard opportunity. Proper coffee, epic breakfast, yummy tapas in a chabby chic surroundings with vibrant pops of colour. 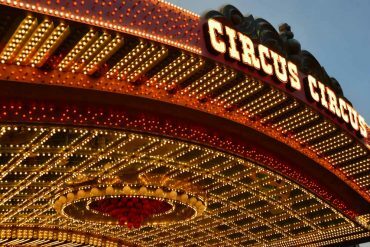 They’ve got it all at Sea Circus. 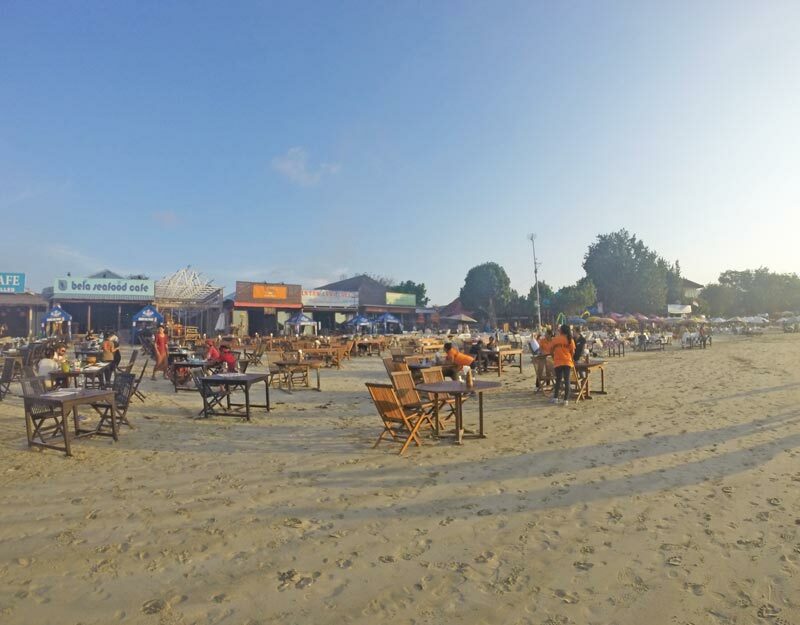 The café is perfectly located to make a stop on your way back from Seminyak beach or resort. 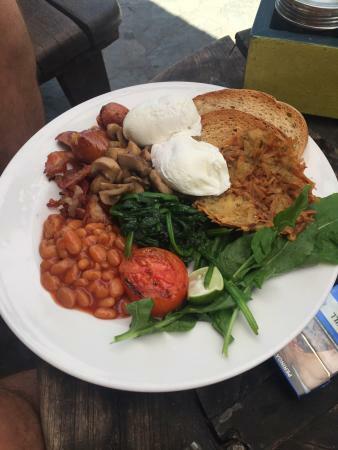 Renowned for their breakfast selections, there’s also refreshing salads, fish and chips, light sandwiches, fish tacos and fresh juices. Pay a little extra for a head and neck massage. 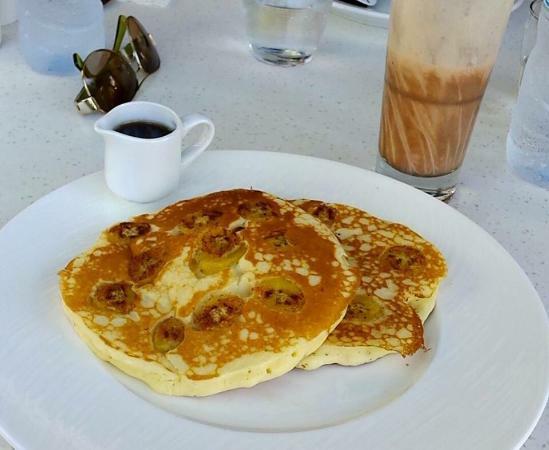 A popular spot for brunch or lunch, try to avoid the midday rush. 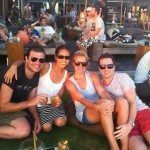 Address: Jalan Kayu Aya [Oberoi Rd] No22, Seminyak, Bali. 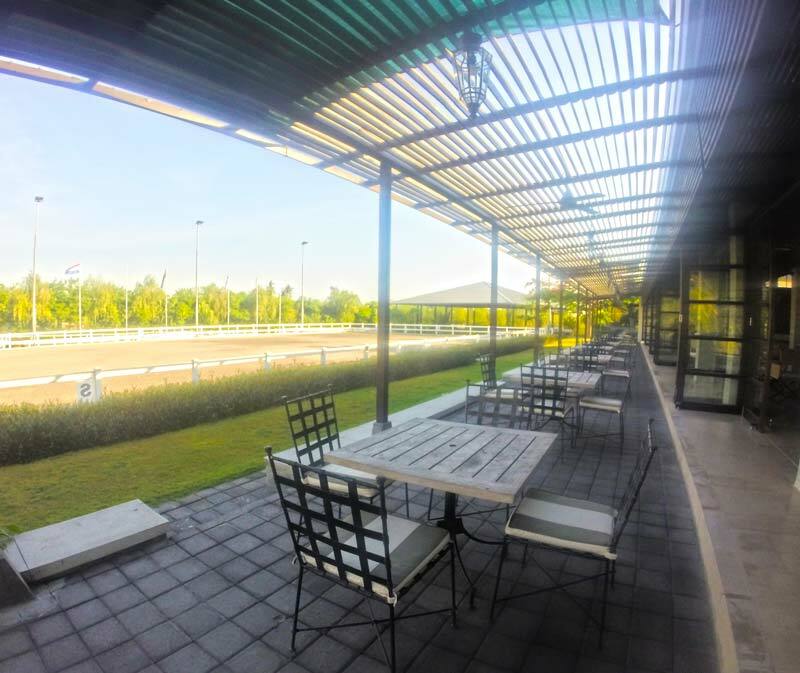 Experience a refined country club lifestyle in the middle of Bali, Aravina Restaurant and Cellar Door at the Bali Equestrian Centre (BEC) offers breakfast, lunch and sunset platters. The superb set-up offers a playground and pool right by the restaurant! Family friendly to a tee and reason why it’s one of the best kid friendly restaurants in Bali. Parent’s can enjoy a house wine overlooking the unique vista of rice paddies and a horse paddock framed by crisp white fences. 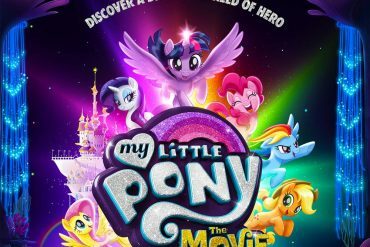 Make it a day out and send the kids to pony camp. There are different pony experiences including: riding and grooming a pony, a pony camp for longer days, pony birthday party and pizza making. Equestrian fans 3 years plus are welcomed to join in the activities. 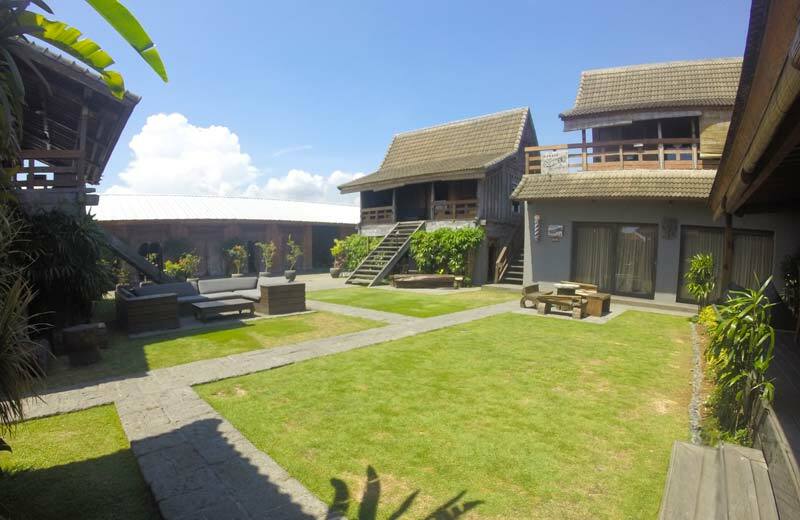 Location: Canggu area, 25 minutes from Seminyak, 35 minutes from Kuta, 1 hour from Nusa Dua and Ubud. 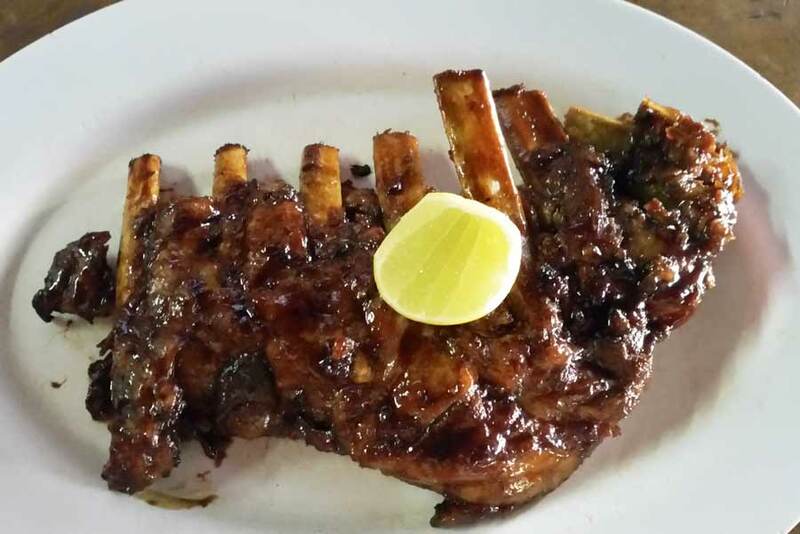 Great for traditional Indonesian BBQ, their pork ribs are heavenly. This simple and small wooden eatery is great for early dinner and late-night drinks. Besides the pork ribs, their menu includes fantastic fries, excellent onion rings, and a variety of burgers, chicken, and sausage dishes. It’s known as one of the best in bali and no foodie guide, but as it’s rustic, simple and laid back it also makes it one of the best kid friendly restaurants in Bali. Arriving earlier is better when it comes to Naughty Nuri’s as they are often packed for dinner and late night. You can’t get any more family friendly that pizza and Pizza Bagus is renowned for the best, easily making it one of the best kid friendly restaurants in Bali. 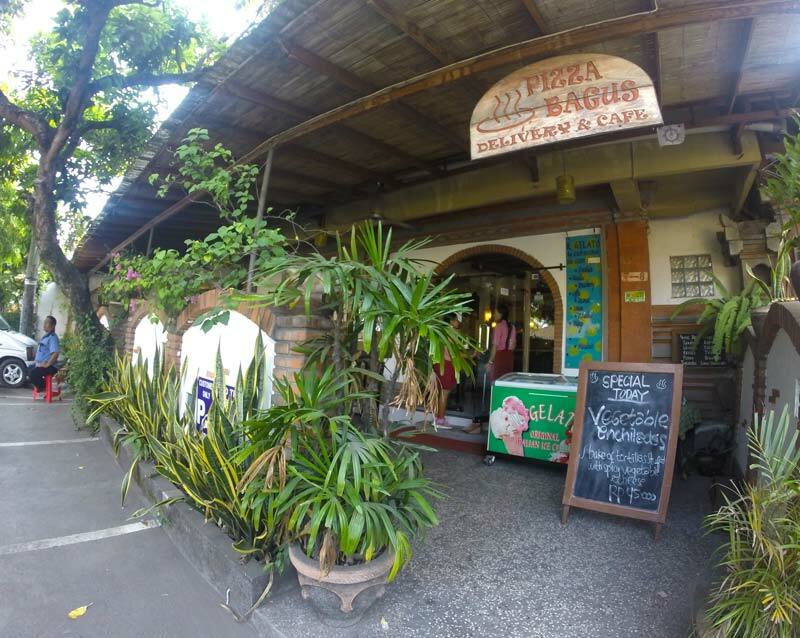 For 20 years, Pizza Bagus has been serving pasta and pizza in the heart of the Ubud neighbourhood. Enjoy their huge menu of Italian cuisine, while taking in their large interior space, which features foosball, a toy area for little ones, and air conditioning. Attached to the restaurant is their gourmet deli. A wide variety of cheeses, meats, and fresh baked bread are available every day. Pizza Bagus also offers delivery and takeaway. 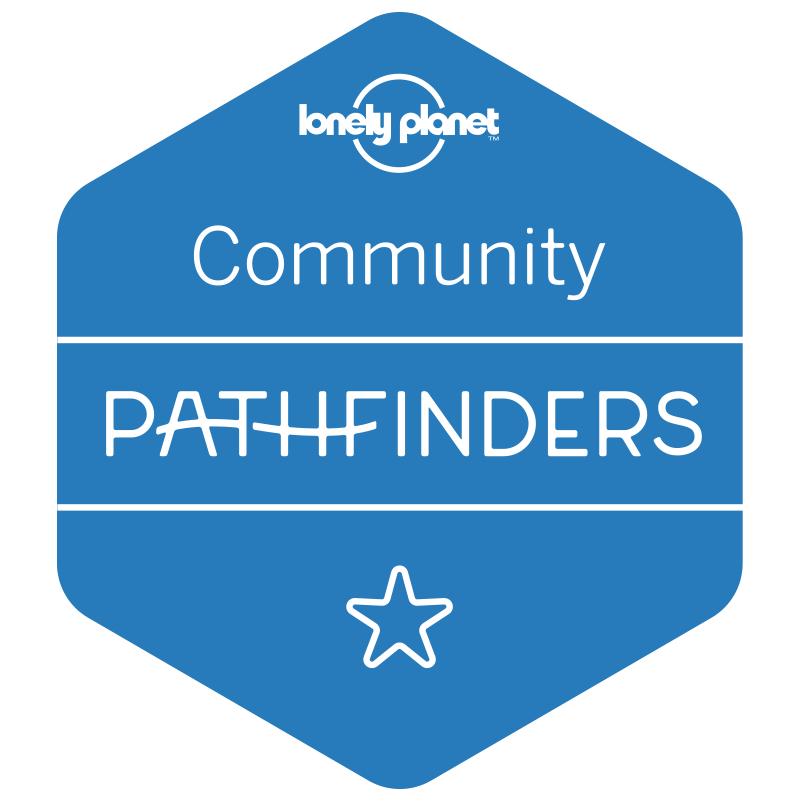 A great family friendly option in Ubud. Soft chicken tacos, crispy beef nachos, fajitas, and chicken burritos are the specialties at Taco Casa. They have the best fresh, authentic Mexican taste in Bali. The menu also features fresh salads and fruit juices, and an 8-layer burrito. Kids will love the cheesy quesadilla’s. 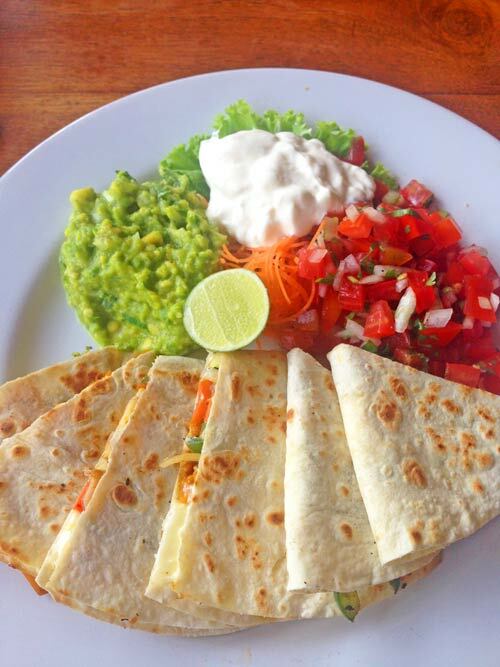 The simple decor, quick and delicious affordable Mexican food and kind staff make it one of the best kid friendly restaurants in Bali. There are locations in both Ubud and Seminyak, both feature a simple menu, open atmosphere, and great beverage options. There are five MozzarellA locations in Bali, but MozzarellA By The Sea stands out for its chic décor and pleasant ambiance overlooking the Legian Beach and one of the best kid friendly restaurants in Bali. Their service is what makes a difference, they have even volunteered to watch over the kids whilst parents eat. The affordable menu includes a wide variety of meat, poultry and seafood dishes, as well as Pad Thai, a steak sandwich, and mie goreng. Don’t miss out on their delectable desserts. Sundara’s menu is filled with local and organic options it’s famous for it’s seafood and the divine Sunday Brunch where it can be accompanied with unlimited bubbles! 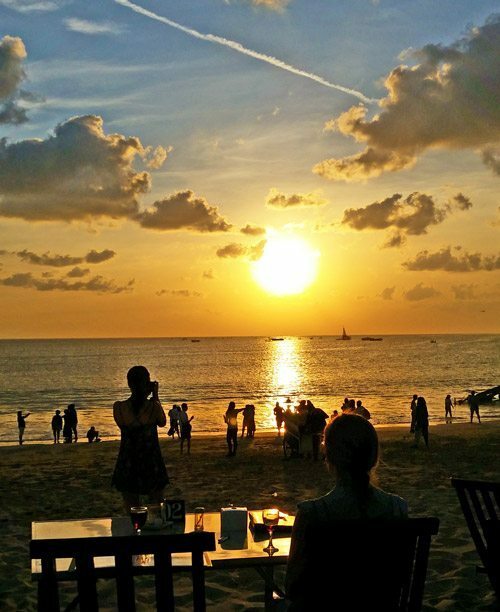 Reason why it’s one of the best restaurants in Bali is because of it’s beachside location, perfect for sunsets. Just for kids there is a Children’s menu and guests can use the Jimba Kids Club located directly next to Sundara. Synonymous with seafood dinners can also enjoy a great selection of Australian lamb and beef at Sundara’s Sunday brunch buffet. Part of the Four Seasons Resort, Sundara has a spectacular infinity pool with panoramic views of Jimbaran beach and the Indian Ocean. Make it a day and hire some sun lounges to chill beachside. 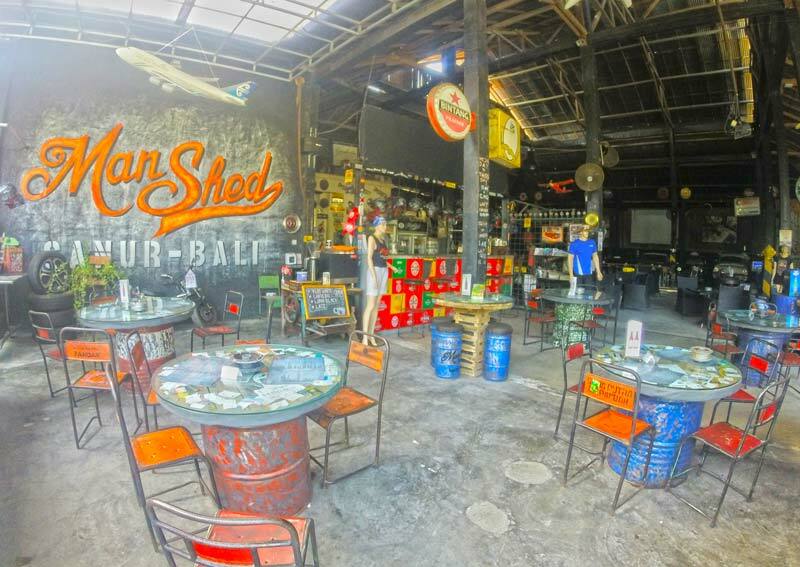 Full of personality, Man Shed Is known for their industrial feel and wide variety of public art. It’s a great place to take older kids and teenagers, especially if you’re looking for a break from the beach. Packed with memorabilia, classic cars, and an interesting crowd, you’ll enjoy your meal just as much as the atmosphere. 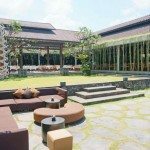 It’s casual setting, unique decor and family friendly menu makes it one of the best restaurants in Bali. They’ve got Western and Asian options served throughout the day. Their specialty? The classic hamburger. If you’re heading there with kids, plan for lunch as the evening scene is more for grown ups. Choose from an African menu or one of their international dishes while enjoying views of the park’s wildlife. It’s the park’s premium restaurant and offers fine dining options like Fois Gras, Tasmanian Gravalax and Salmon. However kids selections such as chicken nuggets and chips is available on request. 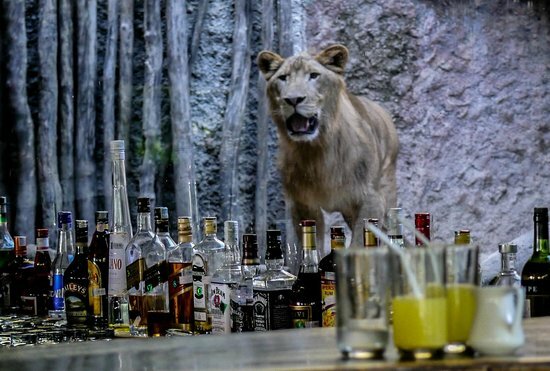 Located inside the Bali Safari & Marine Park, you can enjoy dining by a pride of lions as part of a family visit to the park. Bookings are highly recommended. A simple vegetarian restaurant with a laid back feel, Warung Sopa makes the list as one of one of the best restaurants in Bali because of it’s authentic local feel, open space, a toys area and playground for kids. Their excellent selection of vegetarian foods includes Indonesian and Japanese, as well as a large fresh juice menu and fantastic soups. Try the dahl soup, or some nasi campur. Biku offers afternoon tea, lunch and dinner, you’ll see kids colouring, families playing monopoly, and people participating in a Tarot reading. There’s also a library that solo visitors gravitate towards. Choose either the traditional afternoon tea or an Asian tea time. Both feature delicious teas and a wide variety of snacks and sweets. 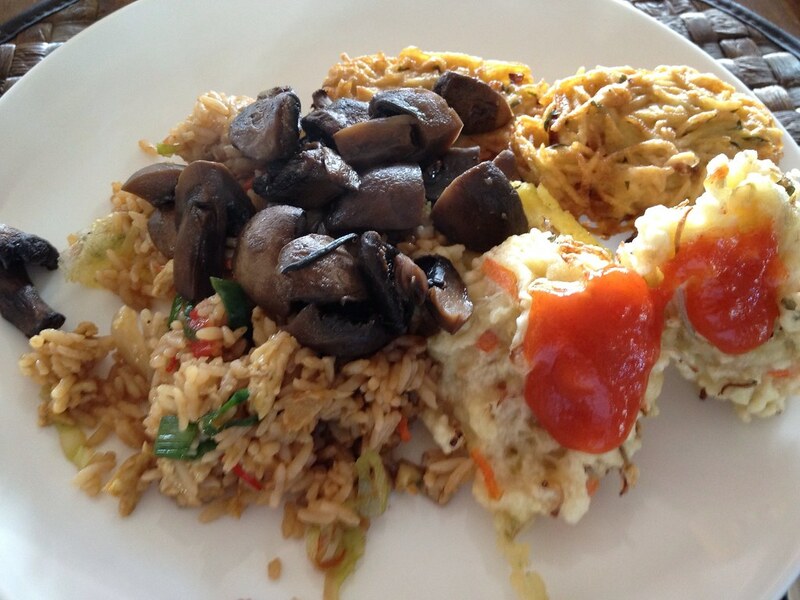 The main menu is extensive, featuring comfort foods Indonesia and Balinese specialties. Tarot readings take place Wednesdays, Fridays, and Saturdays from 1 to 5 PM. Afternoon tea begins at 2:30. They recommend you book in advance as both of these are quite popular. 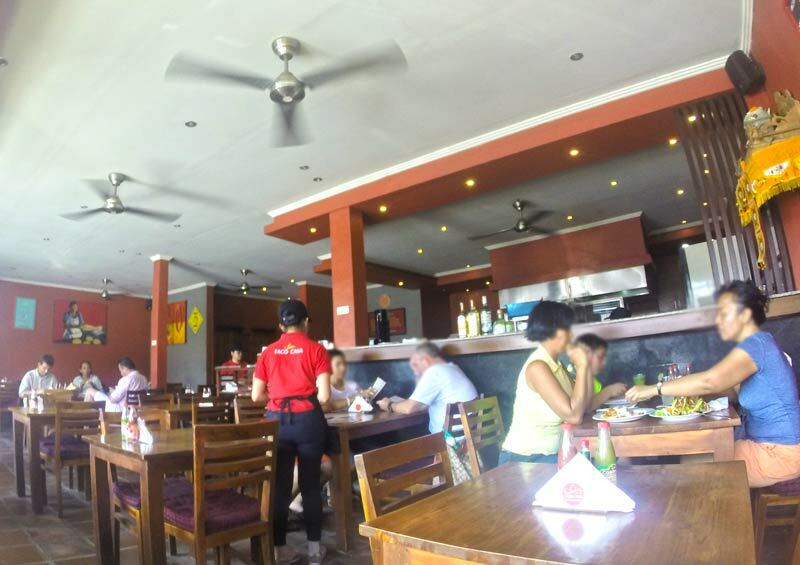 Stop at Zanzibar for breakfast before you head to the beach, the convenient location, relaxed setting and family friendly menu makes for one of the best restaurants in Bali. Zanzibar in the heart of Legian is an Italian restaurant opened by Italian expats several years ago, their meals are generous and delicious. Zanzibar features traditional Italian pizzas, pastas and meats, and an excellent wine list. Also very popular for their American breakfast, complete with bacon, eggs, potatoes and fresh fruit juice. It’s arguably the best on Jimbaran Bay for fresh food and Four Season’s Pandan Sari’s is notably one of the best kid friendly restaurants in Bali. The beachside restaurant offers the freshest seafood selection and gorgeous views in an alfresco setting. Order a la carte or choose one of their family-style packages. Specialties include black stone lobster, jumbo prawns, and shark on the grill. Surprisingly well priced, considering the great location and excellent food. Learn to surf in Bali with surfing lessons available and boards to hire from Old Man’s. The restaurant sits right at one of the best surfing spots in Canggu. Kids that aren’t into surfing or are too young can still enjoy the table tennis and excellent menu selection. It’s a great spot for brunch ad one of the best kid friendly restaurants in Bali. Order the fish and chips, burgers and fries, or there are the usual Asian dishes. They offer a full menu at breakfast, lunch and dinner. Set back from the beach Old Man’s expect great food, great service, and a great place to chill. If your family fancies Japanese, this is a must-try in Bali and one of the best kid friendly restaurants in Bali. The menu offers a wide selection of meals including: sashimi, maki rolls, kushiyaki, and noodles all very fresh and authentic. 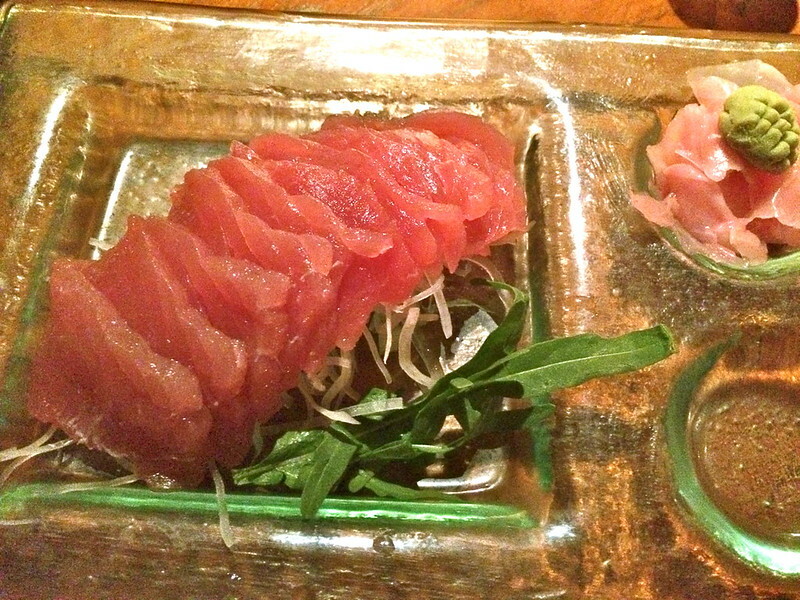 Although there are several Ryoshi locations throughout Bali, their spot in Seminyak is the best. There are different areas to dine, there are tables outdoors fronting the main street, great for alfresco dining in the cool of the night. Indoors there are tables or tatami mats. Enjoy live jazz every Monday, Wednesday and Friday in relaxed setting, perfect for families wanting a casual meal in Seminyak. The service can be a little slow at dinner time, go early to beat the rush. The kids loved the chocolate milk shakes and eating without shoes on. Known for having the best coffee in Ubud, Maha Restaurant offers a relaxing dining experience within the Ubud Monkey Forest. After visiting the monkeys, stop by Maha to enjoy their lovely garden, it’s filled with adorable hopping bunnies to keep families company when they eat. Their menu offers traditional Balinese cuisine in a casual café environment. There is something for everyone here, especially if you’re looking for a casual spot away from thieving monkey’s. At Bumbu Bali, families can enjoy a wide variety of authentic Balinese dishes under the restaurants open-air pavilions. Enjoy selections a la carte, or opt for one of their set menus. Their are beautifully presented platters of single serving coal barbecues accompanied by local condiments. The main draw at Bumbu Bali are their cooking classes. Learn the process of cooking some of the most popular dishes in Bali. 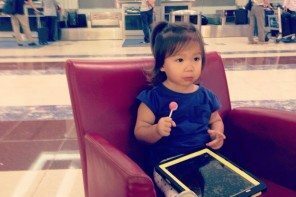 Kids are welcomed or a great activity when the kids are with the nanny or in kids club. Start the day at the market, purchasing spices, meats, and the freshest seafood. Dine on Balinese cakes and fruit for breakfast, then head back to the kitchen to suit up for your lesson. The lesson includes 20 different Balinese dishes culminating in a feast. Classes are offered Monday, Wednesday and Friday, and begin at 6:00 AM. Space is limited so they recommend you book ahead. Dinner guests are entertained with Balinese performances. Bumbu offers all the markings as one of the best kid friendly restaurants in Bali. Métis is another must-visit in Bali and one of the best kid friendly restaurants in Bali. We were lucky to dine as a large group for a pre-wedding family lunch and for a big group, the service was outstanding and the meals executed perfectly without anyone left waiting, as can happen at large functions. Dine from signature French Mediterranean menu, amongst beautiful gardens, ponds and rice paddies. There’s also indoor seating, art gallery and boutique with one-of-a-kind pieces from Bali’s best designers. Huge lily ponds lead to their own gazebo, perfect for kids to play in. Have a run around the courtyard at Metis. Relaxed but elegant garden setting of Metis Restaurant. 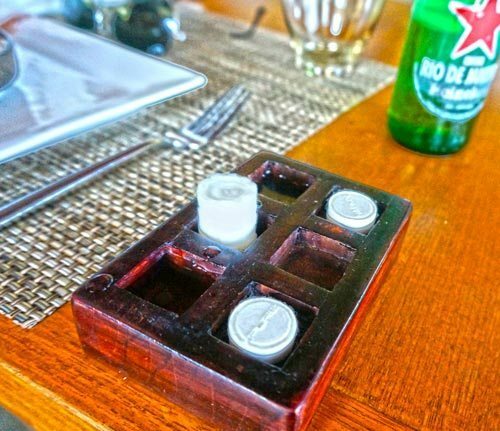 At the end of the meal, patrons are presented with a wooden tray filled with little cotton disks, the kids got a kick out of pouring water over them and watching them expand into wet towels. Fungi bruschette? Spinach raviolli? How about crispy pizza bread with pesto? Get your Italian fix at Il Giardino. A tasty Italian institution in Ubud and one of the best kid friendly restaurants in Bali. The menu features a wide selection of salads, pastas, and main dishes, freshly prepared in their kitchen. For the kids there is the trusty pizza or try one of the homemade pastas. Il Giardino has happy and helpful staff and an all round lovely dining experience. 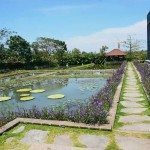 Located away from the main streets and within the Han Snel Gallery, this restaurant provides a calm and relaxing environment with a charming garden and beautiful lotus flower ponds. 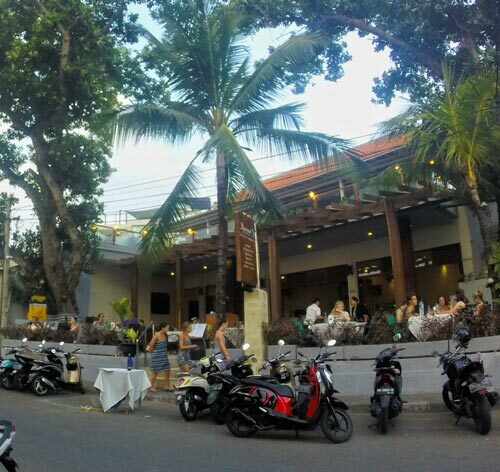 Located on the famed Eat Street and at the intersection of Seminyak Square, The Junction is well known as a funky restaurant with excellent food and service. Affordable, efficient, tasty and clean. It’s ideal for lunches but dinner also suits. High chairs are provided which are not always a guarantee in Bali restaurants. We love this relaxed restaurant with a feel good vibe, where proceeds of the handmade straw dolls go towards supporting the Bali street kids. Great concept and good food makes it one of the best kid friendly restaurants in Bali. Their whitewashed wood finishes and glass jar-lined walls provides a relaxed and trendy atmosphere with great Western and Asian-fusion cuisine. Try their their fantastic selection of crepes, fresh tasty salads and pastas, and choice mains including Belgium Beef Tartar with fries or Beef Rendang. The junction is available for eat in, takeaway, and also offers delivery. Providing healthy options for everyone’s taste, you’ll find fresh, organic menu items, including nachos, potato wedges, samosa, and a selection of fresh pressed juices. Their menu also features several salads, sandwiches, and wraps. Worthy of being one of the best kid friendly restaurants in Bali. Their extensive smoothie, juice, and energy booster menu is a huge draw for health-conscious travelers and locals alike. Zula boasts a cozy space, where you can choose to dine inside or alfresco, or opt for takeaway. Cocoon offers guests an international menu with most dishes fusing Asian and European flavours with a refined and relaxed setting. 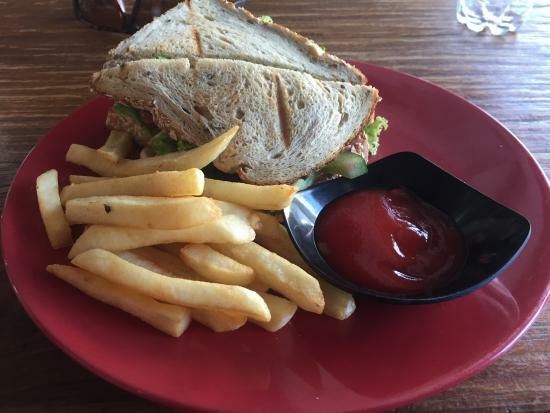 They have a selection of meats, vegetarian options, and gluten-free meals as well as a kid’s menu. Their globally-sourced wine list adds a lovely compliment to any meal. Take in a poolside brunch or dinner under the stars. A great relaxed setting making it one of the best kid friendly restaurants in Bali. Cocoon offers happy hour every day from 4:00 -7:00 PM. This is a huge draw, so it can get busy around this time. If you’re looking for a calmer experience, try visiting for lunch. If you have young children and babies, the club offers child care at a small fee. Overlooking gardens and rice paddies is Sardine, famous for it’s seafood and French inspired dishes, it’s a must-eat when in Bali and the surroundings make it also one of the best kid friendly restaurants in Balie. The menu changes daily according to the catch of the day with an emphasis on fresh and local where vegetables are sourced from a local organic garden. Ask for the kids menu, they don’t advertise it but it’s available with generous servings of pasta and even chips accompanied by a big goblet of ice cream. Great for a family lunch with plenty of outdoor space for the kids, with ponds and cushy lounges. 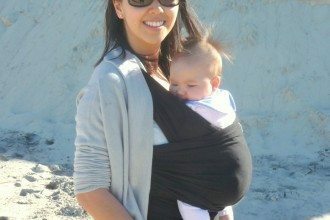 Sardine is particularly romantic at sunset and a good option to go with or without kids. *Average price for a family of 4. ** Prices and open hours are subject to change. Please check with restaurant prior to going. You’re welcome. Thanks for dropping by xo. This is a great list! Many of these are favourites already, but loads I am now looking forward to trying!